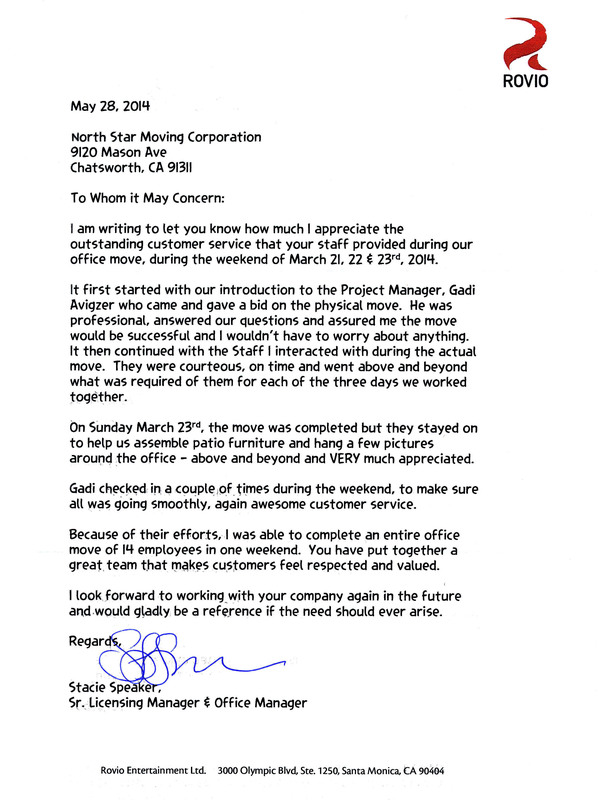 I just wanted to let you know what a great job your movers did in relocating our offices on March 31, 2016. They were timely, efficient, worked hard, and answered our questions when needed. We even finished earlier than originally planned! 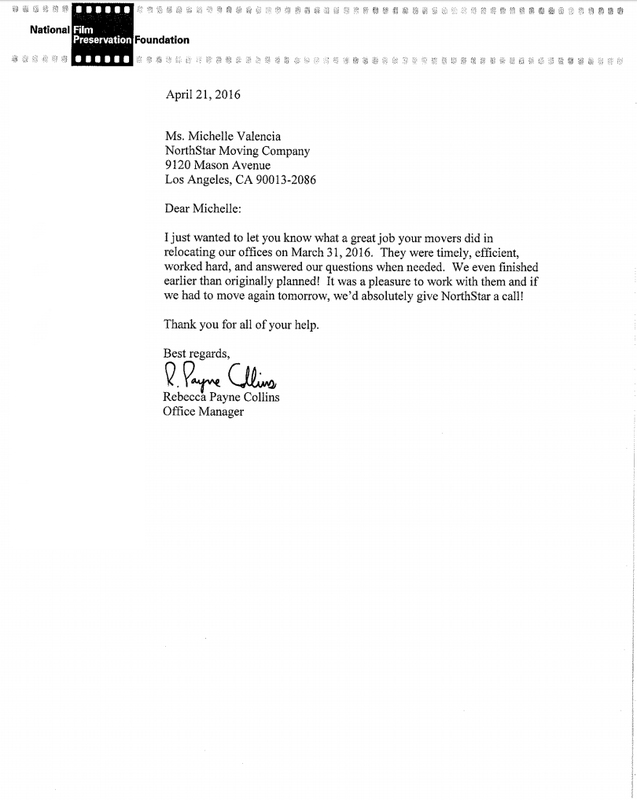 It was a pleasure to work with them and if we had to move again tomorrow, we’d absolutely give NorthStar a call! 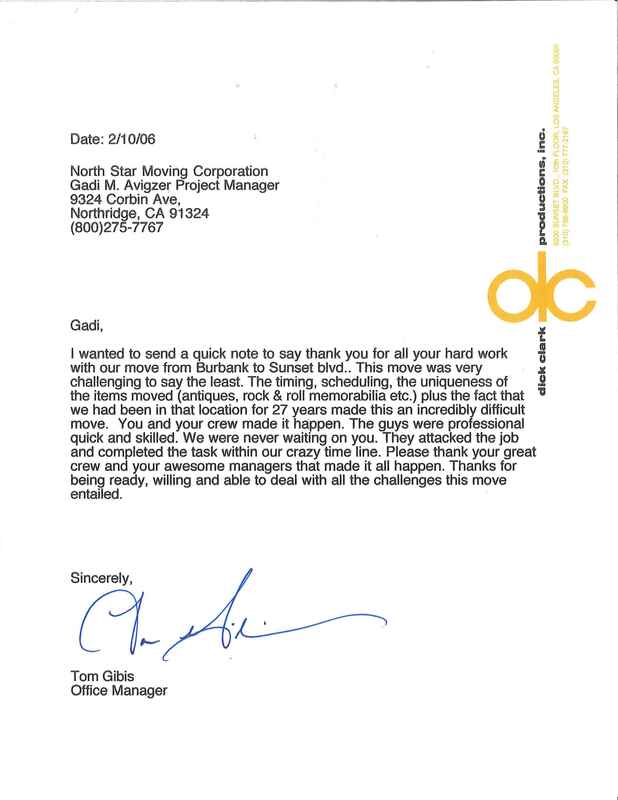 I just wanted to reach out to you to let you know how much your patience and kindness meant to our team and me during our recent move to Los Angeles. Coordinating an office wide Move for 6 employees, while 800 miles away in a different city, is no easy feat. Having your calm presence on the phone every time I had to call and make yet ANOTHER change to our order was incredible. I can only send you this email gift in gratitude for all of your hard work and thoughtfulness, but I hope you enjoy it. My recommendation to your bosses and supervisors is that you definitely deserve a huge congratulations and bonus for your work on our job. 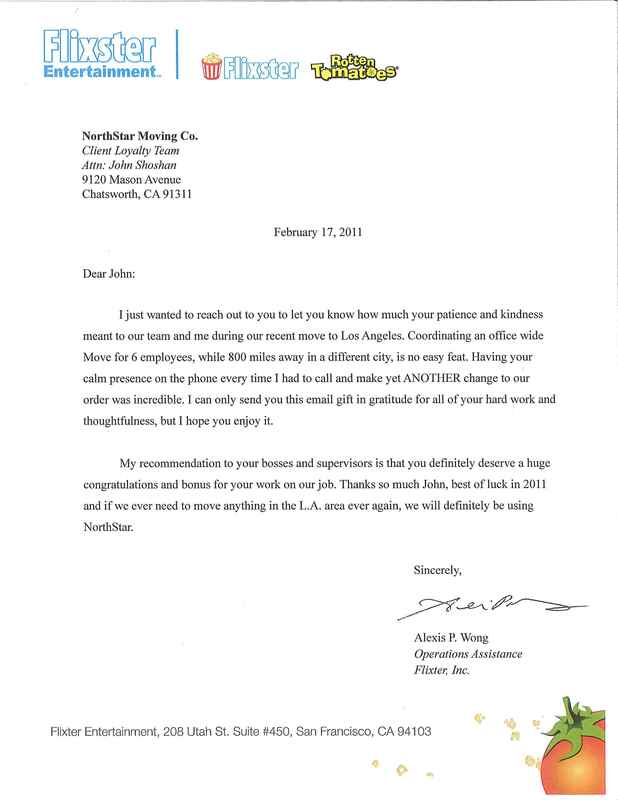 Thanks so much John, best of luck in 2011 and if we ever need to move anything in the L.A. area ever again, we will definitely be using NorthStar. In regarding to NorthStar Moving and their service, they have been excellent, they’re hard workers, they come in as a team and move in and move out very quickly and very efficiently. I wouldn’t choose any other moving company. Thank you, NorthStar Moving. Hey guys, NorthStar Moving did an awesome job they are immaculate, definitely hire them again in the future. Thanks guys. I’ve had the pleasure of working with Gadi and the NorthStar moving company a few times now for both television productions and personal needs. I must say that in both scenarios, I found working with NorthStar an incredibly easy and pleasant experience. Gadi is absolutely outstanding, and rarely do you find someone so passionate about their job and who can truly deliver unparalleled customer service. He is knowledgeable, professional, kind, and prompt. I never found it difficult to get an answer or a solution from him. 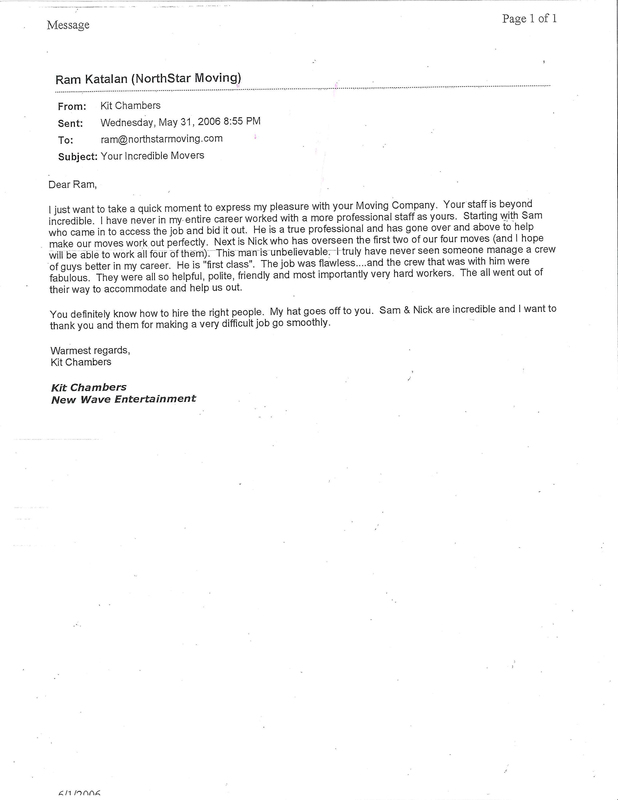 He cares a great deal about the company and the clients and gives everyone such great personal attention. I’ve seen NorthStar move families out of multi-million dollar homes in a day, and I also was lucky enough to have NorthStar move me out of my one bedroom apartment in a few hours. Whether your single and in an apartment or a family giving up their home to a reality show, Gadi and NorthStar both realize how valuable your things are to you, and they pack them delicately, move them out with ease, and make sure you know your things will be well taken care of no matter how long they store them. As a coordinator, I know I can successfully complete my job by returning homes to families the way they left them. As a private client, I know my things are safe and secure, and that I’ll get everything back to me the exact same way I left them. NorthStar is an industry leader in professional moving and storage, and I wouldn’t think of using anyone else. Gadi is a friend and a smart businessman, and anyone or company would be lucky to work with such a great person and successful company. 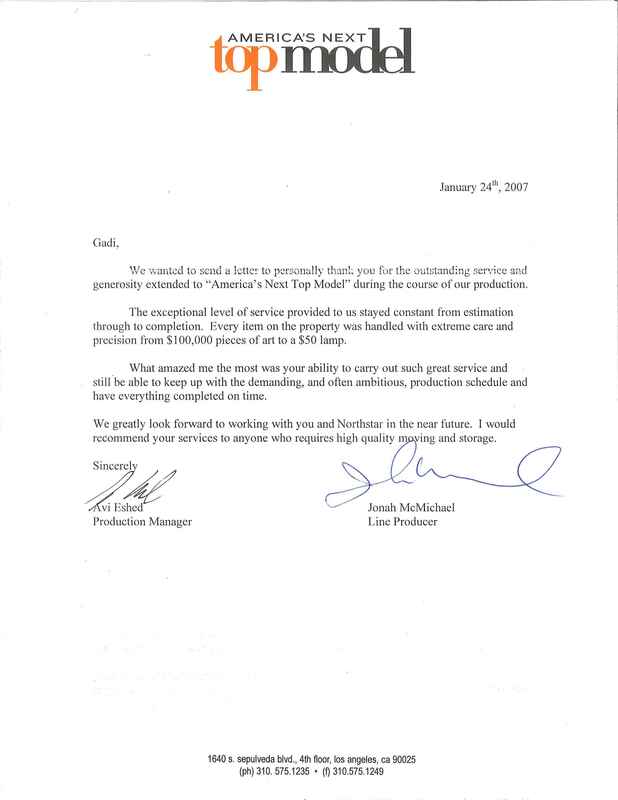 We wanted to send a letter to personally thank you for he outstanding service and generosity extended to “America Next Top Model” during the course of our production. The Exceptional level of service provided to us stayed constant from estimation through to completion. Every item on the property was handled with extreme care and precision from $100,000 pieces of art to a $50 lamp. What amazed me the most was your ability to carry out such great service and still be able to keep up with the demanding, and often ambitious, production schedule and have everything completed on time. 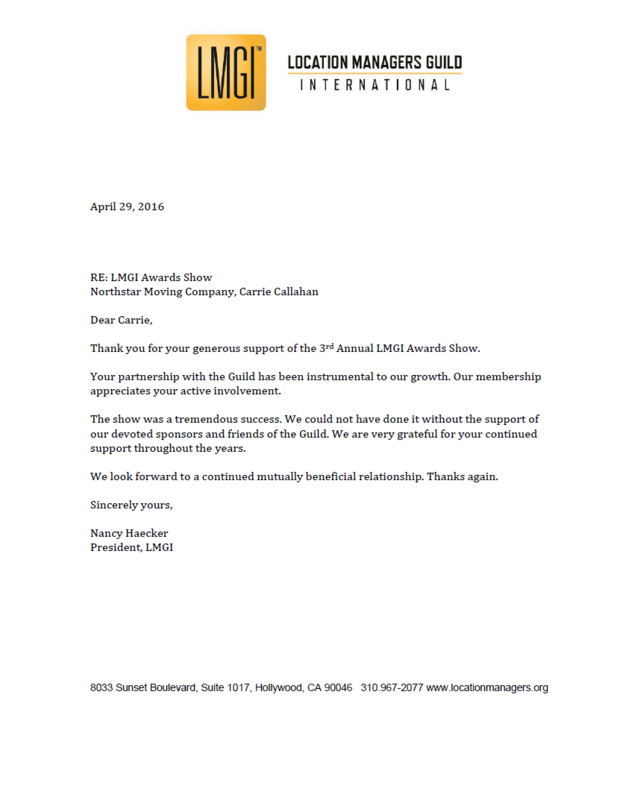 We greatly look forward to working with you and NorthStar in the future. I would recommend your services to anyone who requires high quality moving and storage. I wanted to send a quick note to say thank you for all your hard work with our move from Burbank to Sunset blvd.. This move was very challenging to say the least. The timing, scheduling, the uniqueness of the items moved (antiques, rock & roll memorabilia etc.) plus the fact that we had been in that location for 27 years made this an incredibly difficult move. You and your crew made it happen. The guys were professional and completed the task within our crazy time line. Please thank your great crew and your awesome managers that made it all happen. Thanks for being ready, willing and able to deal with all the challenges this move entailed. I just want to take a quick moment to express my pleasure with your Moving Company. Your staff is beyond incredible. I have never in my entire career worked with a more professional staff as yours. Starting with Sam who came in to access the job and bid it out. He is a true professional and has gone over and above to help make our moves work out perfectly. Next is Nick who has overseen the first two of our four moves (and I hope will be able to work all four of thern). This man is unhelievable. I truly have never seen someone manage a crew of guys better in my career. He is “first class”. The job was flawless ….and the crew that was with him were fabulous. They were all so helpful, polite, friendly and most importantly very hard workers. The all went out of their way to accommodate and help us out. You definitely know how to hire the right people. My hat goes off to you. Sam & Nick are incredible and I want to thank you and them for making a very difficult job go smoothly.